The Badgers will get new helmets if customers buy a limited-edition craft beer at Barrio Brewing. 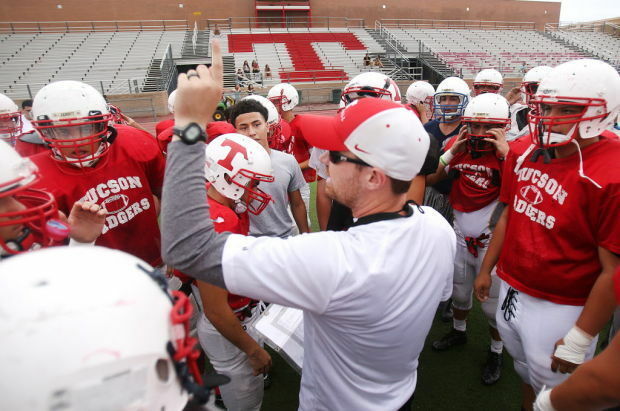 Thanks to some wild weather Friday night, Tucson was treated to an extra day of football. Let’s do it again this week — minus the delays. Tucson High hosts Sunnyside on Thursday night at 7, searching of its third straight win in a game that will be televised live on Cox 7. Sunnyside was among several local teams who were forced to complete games on Saturday after lightning suspended play. But once the Blue Devils did resume Saturday afternoon, they were unable to put up any points and lost 24-3 to visiting Salpointe Catholic, falling to 1-2. Meanwhile, Tucson and coach Justin Argraves are coming off a 33-3 win at Yuma and have bested Sunnyside in each of the last three games by an average of 23 points a game. Boys golf: A pair of Southern Arizona’s best golfers will be on display Thursday at Randolph for a four-team match hosted by Tucson High and featuring Canyon del Oro, Rincon/University and Sunnyside. Tee time is 3 p.m. Leading the pack locally is CDO’s Chris Meyers, who is verbally committed to play for Stanford. Meyers was the top individual at the Cactus Cup hosted by Sabino over the weekend. Additionally, Rincon senior Logan Graybill was the individual winner in two matches last week, on his way to helping the Rangers earn the team win in each. Football: Sahuarita will try to improve to 5-0 with arguably its toughest test of the regular season. Senior quarterback Calvin Jenkins and the Mustangs, who have outscored opponents 144-14 over the last three weeks, will host Catalina Foothills at 7 p.m. The Falcons (2-1) suffered their first loss of the season last week when visiting Cienega held on for a 24-21 win. Although Foothills beat Sahuarita 51-6 last season, it no longer has Ty Cruz, who rushed for 183 yards and three touchdowns in the win. Sahuarita has been tough in its first four games this season as tailback Geovan Neuser has rushed for 11 touchdowns, four of which came in last week’s lightning-shortened win over Catalina. Cross country: More than 20 teams from around the state are signed up for Saturday morning’s Old Pueblo Invitational at Lincoln Park next to Santa Rita High School. What makes this cross country meet fun is the setup: The 3.1-mile races are split up by gender and grade meaning there will be eight different contests for high school runners. The freshmen girls will start it off at 8 a.m. and another race will begin every 15 minutes through 9:45, when the senior boys run. The event, which is hosted by St. Augustine Catholic, is one of the oldest in Southern Arizona and will also feature two middle school races starting at 10 a.m.